Like our eyes, microscopes are limited in what they can see because of their resolution, or their ability to see detail. The detail, or information, from the object is there, but some of it gets lost as the light reflecting off of the object moves through the air. Ulugbek Kamilov, an engineer in the School of Engineering & Applied Science at Washington University in St. Louis, plans to use a three-year, $265,293 grant from the National Science Foundation to capture the information that normally gets lost and add it to the information researchers typically receive from microscopes. Ultimately, this work, along with that of his collaborator, Lei Tian at Boston University, may lead to a more precise microscope that can see objects as miniscule as 100 nanometers, such as viruses. 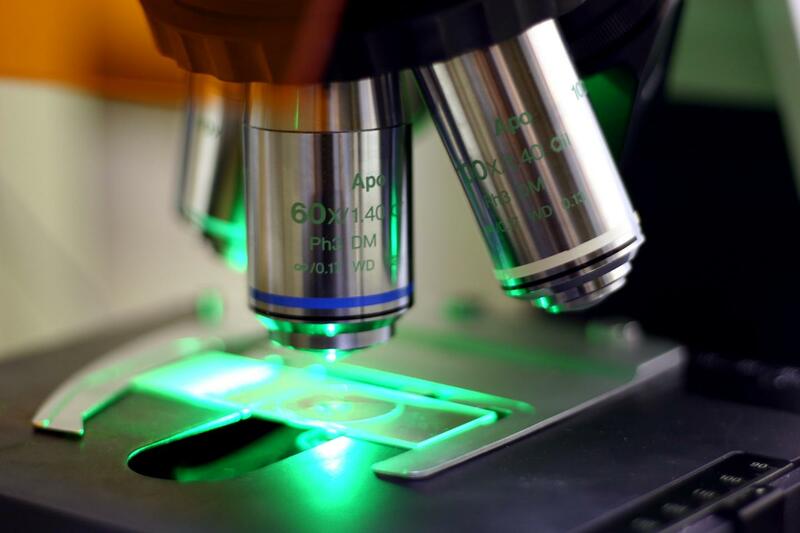 Currently, microscopes have a resolution limit of about 500 nanometers, which allows them to see bacteria. A human hair, for instance, is 100,000 nanometers wide. "The whole premise of this is built on one single fact — the way light interacts with any matter is linear," said Kamilov, assistant professor of electrical & systems engineering and computer science & engineering. "But the reality is that the interaction is actually not linear." For example, if you shine a flashlight through your hand, you can't see the source of the light because it's bending, and that is nonlinearity. With a single cell, the bending is so light that it is nearly transparent, which is linear. When light interacts with a cell or an object, the light going out of the cell loses the information it gathers from that interaction. But because of that interaction, there are fluctuations in the vicinity of that cell that work with such matter and get retransformed and remitted. Those fluctuations are encoded into the nonlinearity of the interaction, but today's microscopes are unable see this, Kamilov said. "We want to take into account this nonlinear interaction of light, objects and premises, and if we do it correctly, we can extract that information, which normally disappears in a current microscope and is treated as 'noise,'" Kamilov said. "We want to decode the information from the noise and add it back into the resolution, and that should give us features that are smaller than the resolution limit." Kamilov said there are two types of noise: imperfections and mathematical noise that is the result of science's current limitations. It is the mathematical noise that he wants to capture. "In reality, that noise is information, and we want to use that information to break the barrier to see beyond the resolution limit," he said. Kamilov's collaborator, Tian, assistant professor of electrical & computer engineering, received a $250,707 grant from the NSF to build a new microscope that will use Kamilov's computational results, algorithms and software and could be used in medical imaging, biological and material imaging, brain mapping and drug discovery. Together, the set of studies totals $516,000. Kamilov also plans to use machine learning to learn the features of the objects they are looking at with the microscope. "We want to look at the distinguishing features of cells so that when we combine them with the nonlinear measurements and fuse that information, we will be able to get higher resolution images," he said. "We hope to get up to five times improvement." Kamilov uses high-powered graphical processing units (GPUs) in his lab, which significantly speed the processing time. What took two days of processing on a regular computer takes just milliseconds on a GPU, he said. "This project is very timely, because we have the mathematical sophistication of signal processing, the computational tools and machine learning," he said. "All of those things have improved together. It would have been very difficult to do this project 10 years ago."